Better RFP responses & proposal management processes. 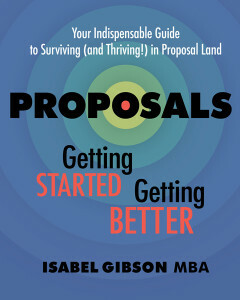 My book has 162 tips, each one associated with one of the 33 tasks required to develop winning RFP responses. These two samples illustrate their content and approach. Subscribe to my blog for access to ongoing training tips for proposal teams. Oversight: Awarding a contract to anyone other than the technically qualified bidder with the lowest price causes serious paperwork, risks bad press, and provokes occasional court challenges. Group evaluations: You might sell one person on your bright idea: it’s hard to sell a whole committee. When they take all the marks and average them, it’s hard to get enough additional technical marks to offset the cost of providing a technically superior solution. Bidding the first of what was going to be a series of outsourcing initiatives, we convinced ourselves that we had to offer a technically superior solution not just to win this nominally best-value contract, but also to entice the client to stick with its outsourcing plan. So we bid more than they specified and lost to the low bidder. And those other initiatives: the birds in the bush, as it were? They never did come out. Answer the question (ATQ) that’s been asked. Do not answer something else. To do that, read the question (RTQ). More than once. Carefully. It’s OK to answer a concern that you know they have, but which hasn’t been stated, but only after you’ve answered the actual question. Note that this rule is often summarized as RTQ/ATQ (and perhaps even more often as RTFQ/ATFQ by the inexplicably cranky people who are editing and reviewing). Sometimes the question seems disjointed, out of sensible order, incomplete in some areas, and overlapping in others. Sometimes, it’s so bad that it seems impossible for you to explain the solution coherently, much less compellingly, if you just answer the question. Welcome to Proposal Land! Your next stop on this fun-filled journey is the desk of the person editing the response or managing your section, to get their perspective and their help. Don’t just write to the question(s) you wish they’d asked. Seriously. Don’t.